They often appear together, but they are not the same, and indeed they can on occasion become enemies. America’s founders understood this, and they distilled this insight in large part from their meticulous study of ancient (Attic and Roman) history. It seems that whenever members of the species Homo Sapiens congregate, the groups they form tend to ostracize individual members. In the context of this dynamic, democracy is merely a way to administer the resulting injustice, as is evident from the word ostracism itself. The ostraka (see picture above) were shards of pottery which the Athenians used as ballots to vote individual citizens out of their city, ie to exile them. The victims (among them illustrious ones, such as Aristides and Cimon) need not have done anything wrong or bad. It was enough that a plurality (with a minimum of 6,000 votes, according to some sources) were sufficiently pissed off at them. … ostracism came to be a handy way of eliminating the unsuccessful, or unpopularly successful, individuals. The piles of scratched ostraka in the Agora Museum in Athens are hard evidence of lives ruined; ‘Kallias’ is ostracised in c.450 BC, ‘Hyperbolus’ in 417–15 BC and another ‘Sokrates’, ‘Sokrates Anargyrasios’, in 443 BC…. An interesting twist is that the practice of ostracism was most popular during Athen’s most “enlightened” period, ie its Periclean Golden Age. Once Athens started losing the war against Sparta and flirted with oligarchic juntas — roughly from 415 BCE onwards — the practice gradually disappeared. … shamed by their defeats in war, confused by the freedom their own political system gave them, the Athenians from around 415 BC onwards chose oppression over liberal thinking. After c.415 BC there was no further need for ostracism – because now the state could harry and censor at will. Socrates’ death came at the end of more than a decade of intellectual and political persecutions. We must never forget that although Socrates is the most famous victim of Athenian oppression, there would have been scores – perhaps hundreds – more like him whose names have escaped the historical record. This practice subsequently became known as scapegoating. I think it was no coincidence that Socrates was killed in May/June – the ancient month of Thargelion. Every year at this time, in an obscure ritual known as the Thargelia, two people – either male and female, or representing the male and the female by wearing a necklace of black and green figs respectively – were exiled from the city as scapegoats. Flogged outside the city walls, their expulsion was a symbolic gesture. The Athenians believed their sacrifice would prevent pollution and stasis from seeping through the city-state. Our word democracy (= people power) is closely related to our word demagogy (= people leading). The two concepts were indeed very close in Athens. And the Athenians were quite aware that in a democracy it is not necessarily the best argument that wins, but the best oratory. In speechifying competitions of this sort the prizes go to the spin-doctors and the state is the loser. The blame is yours, for stupidly encouraging these competitive displays … If something is to be done in the future, you weigh it up by hearing a good speech on the subject, and as for the past, you judge it not from your own first-hand, eye-witness experience but from what you hear in some clever bit of rhetoric … You all want to be the first to make a speech, and if you can’t do that, you try to sit there looking as though you are one step ahead of the speaker … you demand changes to the conditions under which you live, and yet have a very dim understanding of the reality of those conditions: you are very slaves to the pleasure of the ear, and more like the audience of a paid public speaker than the council of a city. When democracies are unlucky, they fall prey to demagogues. When they are lucky, they have leaders. Athens, for a while, had such a leader: It was Pericles. Although he was technically no more than one among equals in the Assembly (this was a pure democracy, after all), his opinions held sway. Pericles, because of his position, his intelligence, and his known integrity, could respect the liberty of the people and at the same time hold them in check. It was he who led them, rather than they who led him, and, since he never sought power from any wrong motive, he was under no necessity of flattering them: in fact he was so highly respected that he was able to speak angrily to them and to contradict them. Certainly when he saw that they were going too far in a mood of over-confidence, he would bring back to them a sense of their dangers; and when they were discouraged for no good reason he would restore their confidence. So, in what was nominally a democracy, power was really in the hands of the first citizen. … Socrates goes further, he suggests that tyranny is spawned by the liberty of all in the demos. Here he is the first to suggest that liberty is an illusion fostered by the great to keep the many happy. Come then, tell me, dear friend, how tyranny arises. That it is an outgrowth of democracy is fairly plain…. It’s been an exhausting but satisfying and edifying week. I spent all of it speaking, rather than writing, and I learned a lot about the difference. It’s my fifth Special Report (we used to call those things “Surveys”). I usually urge people to read a Special Report on paper, or as a PDF, because it is really one single narrative, with each chapter leading to the next and none meant to be read in isolation. Online readers often land on one chapter and don’t realize it is part of something bigger. I tried to remember and list all the sources here, but it’s inevitable that I forgot somebody, so apologies. Once the report was published, two of my colleagues — Amy Jaick and Dayna De Simone, our brand enhancement geniuses — ferried me around California to “market” the report. and then continued even more with lots of live-audience public speaking and debating, at UCLA, the World Affairs Council, the University of San Francisco, and on and on until I was numb and hoarse. As you might remember, I’ve long been pondering the difference between the written and the spoken word, so it was constantly on my mind this week. The two are really completely different. You can write well but speak awfully, or speak well but write awfully. (You can also be good or bad at both, of course). All of which is to say that this was really a great warm-up for the speaking I’ll probably be doing in January when my book comes out. And that takes quite a bit of practice, especially since I don’t believe in using any written notes at all. The only reason, as far as I can tell, why somebody might want to hear a writer speak (as opposed to just reading his writing) is spontaneity, which equals authenticity. If you’re speaking from written notes, how can you be spontaneous? Whenever I’m in an audience and a speaker uses written notes, the oratory is dead and boring. So I speak “naked”, as it were, which can, admittedly, be a bit nerve-racking. I did get sidetracked a couple of times. But as the week went on I got better at my pacing. Every talk was partly the same and partly different, and Amy and Dayna gave me great feedback on what worked and what didn’t, so that “the speech” kept improving. And the reaction from the various audiences was fantastic. At every event, we ended up having a lively debate. I was learning a lot from the audience. And learning is really my main hobby. So I guess it was a good week. As it happens, there is a much, much better treatment of that distinction in this lecture by Hunter Rawlings, a classicist at Cornell (as well as that university’s former president). As Rawlings puts it, neither society, Greek or American, would regard the other as “free”. The Greco-Romans had a communitarian (and largely tribal) definition of freedom and were concerned about virtue (but hardly at all about property). Enlightenment thinkers, starting with John Locke, defined freedom in much more individualistic terms and were more concerned about property than virtue. The mixture of the two strands was at first (in the minds of geniuses such as Madison or Hamilton) tonic. But something has arguably gone wrong in the centuries since then, leading us gradually to stunningly childish and unsophisticated notions about freedom today. A short excerpt of the lecture is below, but I hope you take time for the full hour, because it is fascinating and touches on all the topics dear to The Hannibal Blog: Greece and Rome, the Founding Fathers, democracy, et cetera. Incidentally, I discovered the speech through this Greek blog post, which discusses some of my own posts and which Google has only translated for me very imperfectly. Thank you very much! I have been researching James Madison for a little project that I am not yet entirely at liberty to disclose. And my research is reminding me to be extremely impressed–so impressed that he may just be my favorite founding father. He certainly belongs into my pantheon of the world’s greatest thinkers. Madison, of course, was not only the fourth president but also, and more importantly, the “father” of the US Constitution. He was the one who took the official notes in the sweltering summer heat of Philadelphia in 1787, and the one whose “Virginia Plan” (which was delivered by the other Virginian delegate but conceived by Madison) formed the basis of the subsequent compromises that led to our constitution. He was 36 years old at the time, and as physically short as he was intellectually giant. Wouldst that America had a man of his ilk today. the republican, as opposed to democratic, vision of liberal government, where both ‘republican’ and’democratic’ are properly defined. Madison originally preferred to use the word republic to describe the new America they were building, as opposed to the word democracy. Republic comes from the Latin res publica, which means ‘public thing’–in other words a country ‘owned’ by its people rather than by a monarch. Deriving from Latin, the word reminded educated men such as Madison of republican Rome (ie, Rome before its civil wars), which was so remarkably stable and moderate, and which so impressed Polybius. Being a public thing, a republic implicitly contains the element that we would call democracy, but it is understood that this is a representative democracy, in which the people choose representatives who in turn decide the issues of the day in competition with other branches of the government. Governance, in other words, has a basis in the people but is removed from the mob. Most importantly for Madison, minorities in this republic are protected from majorities. He recognized that the tyranny of majorities is perhaps the greatest threat to freedom (which liberal thinking is all about, after all). Put differently and in modern lingo, Madison was the opposite of a ‘populist‘. If he were around today, certain ‘real-America’ Alaskans would attack him with demagogic effect for being elitist. Democracy, by contrast, comes from the Greek and means ‘rule of the people‘. The connotation to educated men such as Madison was therefore ancient Athens, during the Periclean era of the Peloponnesian War, which had a direct democracy as opposed to the balanced representative one. As part of another project that I’m not totally at liberty to disclose yet, I am also looking into that Athenian democracy right now. And allow me to state clearly that it ended in chaos and failure, in pre-emptive wars (Sicily) that should never have happened and mob-mad injustices such as the trial of Socrates. Direct democracy is of course alive and well today in western states including California. In a mindlessly populist culture, it is a popular idea. (Stuck in a debate? 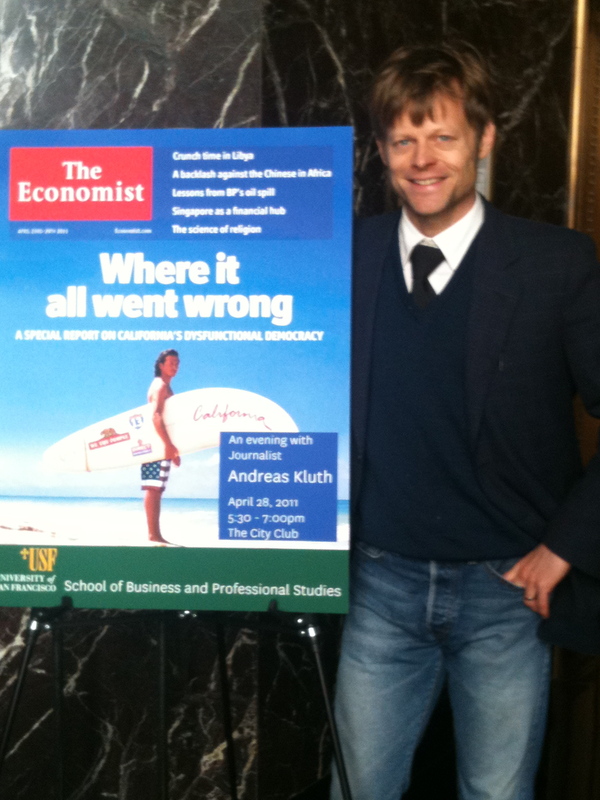 Just say “let the people decide!”) What that leads to I have described in The Economist. Lest any of you think that I have abandoned my thread on Socrates, far from it! Indeed, the reason that you haven’t heard much lately from me about the great and controversial and perplexing man is that I’ve decided to do a big piece on him in the Christmas issue of The Economist (large parts of which we actually produce in September). So am I thinking about him? Every day, especially this week, as I cannot avoid, no matter how much I try, the news about these alleged “town hall meetings” on health care. Oh, please. This is what the thread on Socrates has been about: Good versus bad conversation, debate that wants to find truth and climb higher versus debate that wants to win, to debase, to obscure. Recall, for a moment, the famous lad who went out one Friday night, ordered gin with orange juice and got tipsy. He went out again Saturday night, ordered vodka and orange juice and got tipsy again. He loved being tipsy so much, he went out and bought himself a whole liter of … orange juice. Let’s now look at the role of democracy in freedom. Is it the gin or the orange juice? Last time in this thread–an emerging ‘freedom lover’s critique of America‘–I shared with you my experience of living in Hong Kong as an instructive way into understanding life in today’s America. In brief: I felt freer in Hong Kong than anywhere else I have ever lived; I feel less free in America than anywhere else I have lived. Even as my fingers still touched the keyboard, I started bracing myself for some inevitable rejoinders. Of which the first and most obvious is: Hong Kong is not a democracy, whereas America proudly is! I once belonged to a salivating pack of expatriate journalists in Hong Kong who loved to scrutinize every Asian government we covered based on its minute-by-minute body language toward democracy. It was an evergreen topic for us, easy to pitch to an editor, easy to write, easy to be smug about. Hong Kong, during its suspenseful transition from British to Chinese rule, was a particularly good place for “democracy” stories. If an errant Falun Gong meditator from Ohio or Liaoning so much as got stuck in his Lotus pose, I was ready to suspect sinister interference from the Mainland. On the Mainland, whenever I got stuck in an interview, I whipped out that word, democracy. In Taiwan and the Philippines, officials occasionally played the trick on me: They whipped out the word to buy time. After all, what else could I possibly demand as long as the place was, you know, democratic and thus surely free. In America, George W. Bush was composing entire inaugural addresses around just two words–freedom and democracy–as a way of explaining wars and himself. Very few people called him on that particular association. The two do seem to go together. Actually, they do not. They can, but they need not. In Foreign Affairs, twelve years ago, Fareed Zakaria coined two powerful memes: Illiberal democracy and liberal autocracy. (That’s liberal as properly used.) He simply observed that there are an awful lot of democracies–ie, countries whose governments are chosen in elections–today whose citizens are anything but free. And there are quite a few autocracies whose people are free. Hong Kong is one of them. Another free (ie, liberal) autocracy in history was colonial America, before the British started imposing exotic new taxes. The king was far away and left the colonials alone. They had no say in government, but did not care because they were free to live their lives. I once read somewhere (if anybody could point me to the link, I would be grateful) that this was the freest period in American history. Democracies have ever been spectacles of turbulence and conflict; have ever been found incompatible with personal security or the rights of property; and have in general been as short in their lives as they have been violent in their deaths. In general, the founding fathers believed Polybius: the best government balances monarchy, aristocracy and democracy. Without such balance, monarchy becomes tyranny; aristocracy becomes oligarchy; democracy becomes mob rule. Today, this skepticism about democracy lives on in a small circle of libertarians/liberals such as Ron Paul, who worry about “majoritarian” oppression. If you read this to mean that I am against democracy, you have misunderstood this post. I am not necessarily against it. And yes, I do love Winston Churchill’s wit. I am merely pointing out that democracy can coexist or conflict with freedom. Some of us have got used to seeing the two together, like orange juice and vodka in a screwdriver, and have made an inappropriate association. But democracy is irrelevant to our topic. The origin of freedom is to be found elsewhere. And we will look for it. His ultimate explanation for Rome’s greatness was that Rome had a constitution that was uniquely and perfectly balanced between the three types of government: monarchy, aristocracy, and democracy. But Rome achieved balance: the consuls were the monarchical element, the senate the aristocratic, and the popular assemblies the democratic. Our founding fathers agreed with Polybius completely. And so they set out to create that same, perfectly-balanced constitution. Arguably, they succeeded. So we are the modern Rome of Polybius!